Theo and Bonnie Ramsey purchased Cheese’s Food Center April 1, 2015. They are honored to carry the torch lit by the Cheese family in 1895, selling groceries from the early days of Lenox, Iowa. Lenox was established in 1872 and is located in Southwest Iowa, in Taylor County, with a population of 1,500 plus. With its friendly atmosphere, safe environment and shining hospitality, Lenox is a great place to live, work, play, worship and raise a family. Thanks for reaching out! 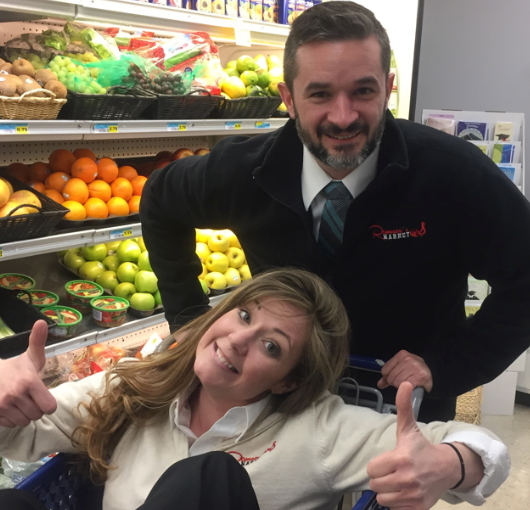 Ramsey’s Market is committted to building strong relationships in our community and across our business, including with neighbors, suppliers, funders, and government offices. Please use the following contact information to reach us for press inquiries, financing/funding opportunities, inventory and supplier relationships, employment opportunities, and general comments or questions. Theo is passionate about engaging a strong food network and community connections and contributes 14 years experience as a leader in civic engagement, process improvement, and technology infrastructure. Favorite Foods: bulletproof coffee, a really good burger, and just about anything made with eggs and tomatoes. Bonnie is a Taylor-county native and is a dynamic, hands-on leader with over a decade of experience in marketing, event coordination and customer service and has a passion for building meaningful connections. Favorite Foods Experiences: trying new recipes, dinner with friends and family, and her mother’s cooking.